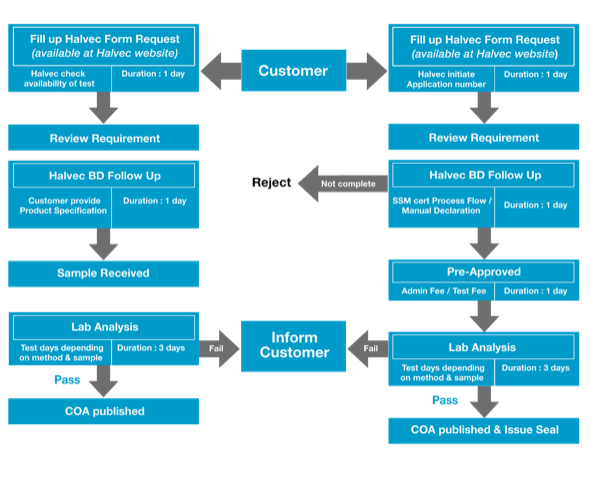 SEAL VERIFICATION SCHEME (SVS) introduced by Halvec Laboratories Sdn. Bhd. is a laboratory verification seal that is primarily granted for the purpose of providing products with an assurance for halal safety and reliability before being marketed. Products bearing Halvec’s SVS demonstrates product compliance with halal syariah standards that eradicate the utilization of any prohibited or unlawful ingredients. The products will be concisely tested by Halvec’s ISO 17025 accredited laboratories to ensure that the products are free from any porcine contamination and/or alcohol content. Furthermore, Halvec lab has also been appointed as one of the JAKIM’s panel lab. During the process of Halal Logo application from JAKIM, the seal acts as a technical support for the product’s halal integrity status which assists in enhancing its trustworthiness. In addition, it will only be provided if the products meet the standard requirements of halal analysis criteria. The function of this Seal Verification Scheme can only be applied with Certificate of Analysis (COA). ISO 17025 qualifies laboratories that implement competent and generate valid results in testing, sampling and calibration operations, thereby promoting trustworthy in their work both nationally and around the globe. It also helps to ease cooperation between laboratories and other bodies by generating wider acceptance of results between countries. Test reports and certificates can also be accepted from one country to another without the need for further testing. SEAL VERIFICATION SCHEME is primarily useful for products that demand halal verification and security. Not only it has given products supplier an upper hand in improving halal security of goods, but also helped in gaining and restoring trust from consumers especially Muslims who might need to be feeling confident that the product they consume does not contain any prohibited or unlawful ingredients. Additionally, products suppliers are capable to maintain their business in the meantime while having to hold back for halal logo application process from JAKIM. Moreover, the seal can also add an eye-catching feature that quickly lends perceived value to a product. In relation to this, local business industry performance could be sustained which, in turn, improves economy and international trade. Owing to their versatility, these seals come with a unique feature which in softcopy (jpeg.file) version. The softcopy (jpeg.file) version is assigned for products suppliers who have not printed their packaging yet, in intention that the seal could be printed along together with the packaging. The customer purchasing the product should be able to locate the presence of the seal without having to open the packaging. None of the product particulars on the packaging shall be covered over by the seal. The design of the seal contains the company logo on the top which portray the ownership of Halvec Laboratories Sdn Bhd. 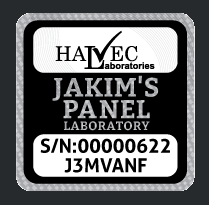 A JAKIM’s Panel Laboratory logo is included on the seal to show that Halvec Laboratories Sdn. Bhd. has been authorized as a panel lab of JAKIM which also entrust for halal product testing. Every seal has their own application number (A/N) and hologram feature for identification and controls. Halvec’s Seal design is systematic, secure, traceable and in control by Halvec management team. To enable consumers to further verify the authenticity of the SVS label, Halvec Laboratory has integrated the hologram features onto the SVS label in order to substantiate its security function (Hiden ‘TRUST SEAL’ phrase will appear if visualized under high intensity lights). This is undeniably crucial to encounter any creation of counterfeit Halvec’s seal by irresponsible parties. Any companies or products suppliers including Multi-National Company (MNC), Small and Medium Enterprise (SME) and Small Industry (SI) are the parties applicable for the SVS. The products include cosmetics, pharmaceuticals or food-based products. The scheme is also applicable to products supplier who has applied or in progress for JAKIM Halal certification. The validity of the SVS is subjected to yearly renewal. For Seal renewal, it is subjected to yearly renewal. Reminder and notification will be sent out 3 months earlier and all renewal application must be submitted 2 months before expiry. The validity of the SVS is subjected to yearly renewal. During the validity period companies must send sample batch twice a year for monitoring purposes to ensure the content of products carrying the SVS is continuously verified. 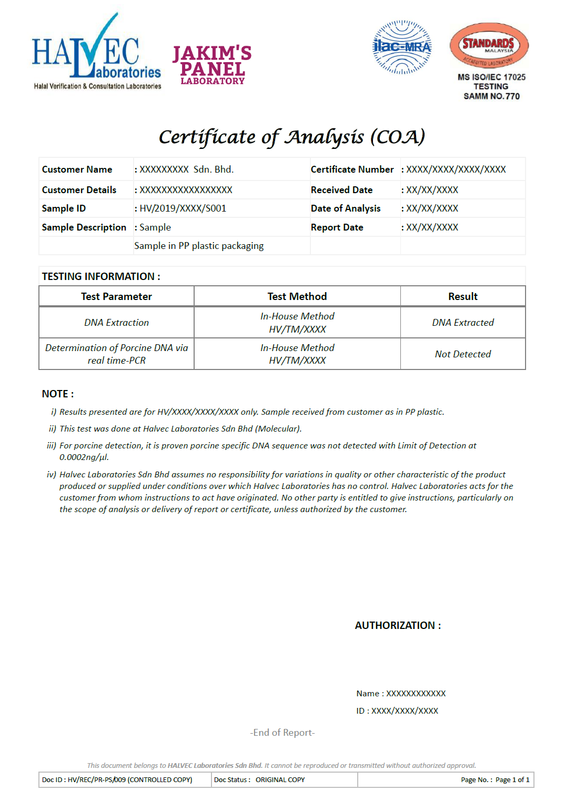 Figure below shows example of certificate of analysis (COA) that may assist in certification application for HALAL, HACCP, Cosmetic Labeling or supporting document for export purposes. It shall be produced upon completion of each test as described in the process flow.